This fully integrated study system covers every aspect of the Oracle Database SQL Expert exam, and has been thoroughly updated for Oracle Database 12cThis comprehensive study guide from Oracle Press enables readers to prepare for the SQL Database Expert Exam with total confidence. 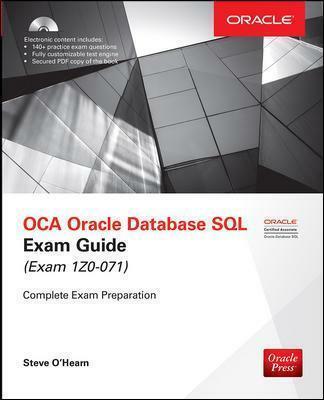 Ideal both as a study guide and on-the-job reference, Oracle Database 12c SQL Certified Expert Exam Guide features examples, practice questions, and chapter summaries. Between the book and accompanying CD-ROM, you will have access to more than 150 questions that match the topics, format, and complexity of the real test. This study system covers all of the objectives for the Oracle Database 12c SQL Expert Exam in full detail and features up-to-date coverage of advanced SQL features related to Oracle Database 12c. An "exam readiness checklist" at the front of the book and "inside the exam" and "two minute drills" sections at the end of each chapter reinforce key skills. You will acquire in-depth knowledge of SQL programming and relational database concepts and will be prepared to sit for the Oracle Certified Expert exam.